Oh Lord prepare me to be a sanctuary, pure and holy, tried and true. And with thanksgiving, I’ll be a living sanctuary for you. This is the prayer I sang, together with the Ocean Exploration staff during staff training week. We sat together, in a rough circle on the floor of the Beit Knesset, absolute strangers to each other, everyone far from home (Seattle, Tel Aviv, Alberta, Pennsylvania, San Mateo), all of us connected in the one important goal of forging a sanctuary in the form of Ramah Galim. We bravely sang these words together, hearts wide open, hopeful. We created and nourished a living sanctuary; a safe place, a refuge, an interconnected ecosystem where we explored, prayed, laughed, grew, and thrived with 250 diverse campers and 45 fellow staff members. As I reflect on lessons learned from our intense inaugural summer, I am struck by the similarities between our camp and a living ecosystem, by how smoothly our ancient Jewish values flowed into modern environmental sensibilities to provide the nourishment for our daily adventures. Like the exquisite Monterey Bay Marine Sanctuary, Ramah Galim’s success hinged on the health of our dynamic ecosystem, the habitat it occupies, and the complicated and varied relationships that comprise it. Success in any ecosystem depends on these few key factors: a stable habitat, a diversity of constituents, and their healthy relationships. So it was with our Ramah Galim ecosystem. 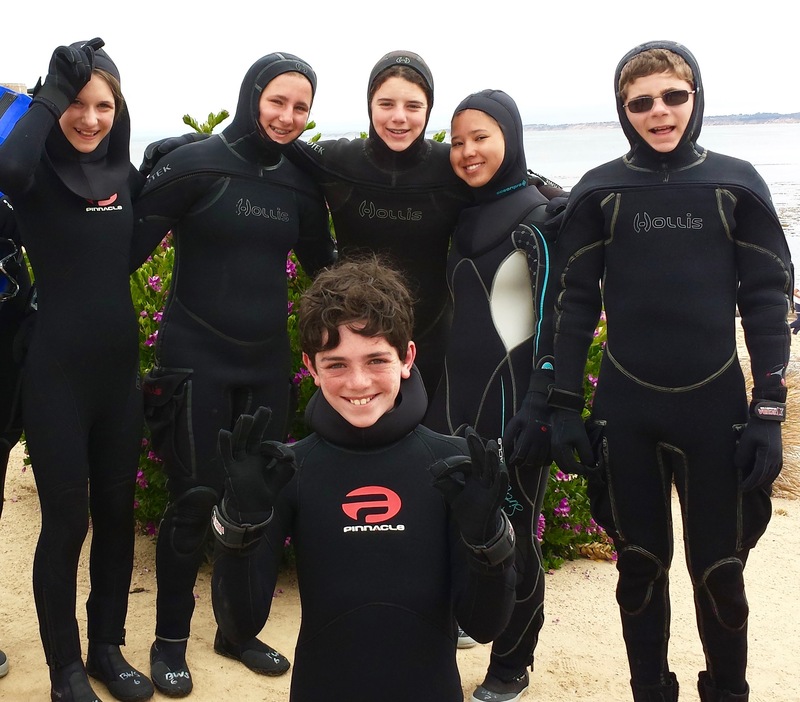 Our beautiful oceanfront habitat, the Monterey Bay Academy, provided the substrate for our programming to take hold, and our staff members and campers were diverse in every dimension. Yet the most essential piece, and the hardest one to plan for (and my favorite) is the magical synergistic interconnectedness of organisms living together. Without the true give and take of mutualism, relationships get out of whack, eventually falling apart. This lesson was fun to teach, easy to see all around us (sea stars have pet worms to keep them clean! What’s in it for the worm? ), and readily internalized by the campers. We frequently assessed our actions in terms of, “Are we harming or helping? Is this relationship parasitic or mutualistic?” We took our cue from the many complicated, symbiotic relationships in Monterey Bay and within our weekly Torah portions, and strove for mutualism by being part of the solution, stepping in and helping, and connecting ourselves to each other through give and take. Through this web of mutual support and interconnectedness we were able to surf, learn, kayak, scuba dive, and observe the marine world together in ways we could not possibly have done as individuals; a true ecosystem in action! I recall the many days we spotted “our” resident pod of Tursiops truncatus (bottlenose dolphins) surfing and foraging in the breaks of our beach. 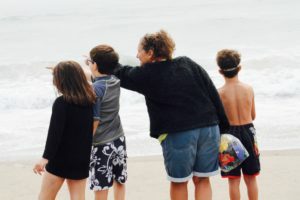 Their teensy newborn dolphin first appeared when we did, way back in mid-June and relied on a loving, involved community to grow and thrive, just as we do. I remember a group of 9th grade campers circled up in the sand around a pinnacle of sculpted driftwood, eyes closed, humming Shema until a shrieking Osprey, right overhead, perched on the driftwood, davened its own loud whistled kyew kyew kyeeeeew. 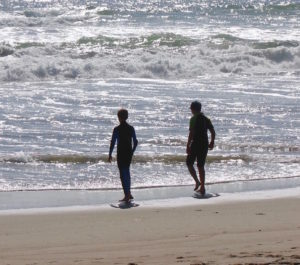 I will never forget intense conversations while walking back from our beach to lunch, dropping off our gear at Beit Galshan (House of Surfboard) while connecting the drought in California with the disappearance of Miriam’s well in parshat Chukat. 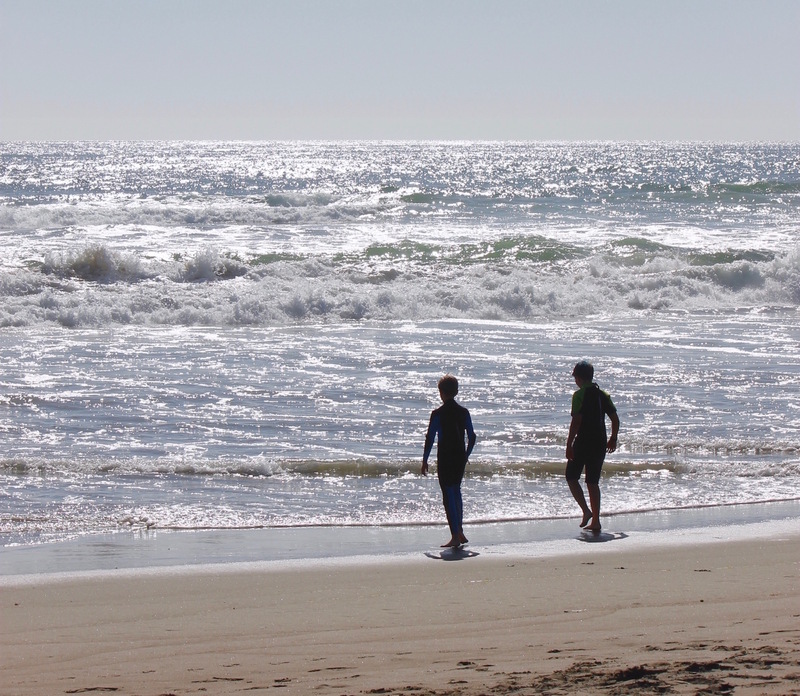 But most of all, it strikes me, again and again, that these precious memories float up the way that vital nutrients well up from the Monterey Submarine Canyon, enriching the ecosystem of the sea, providing nourishment until next season. What Sophia, Deanna, and Marci learned this summer about improvisation, creativity, and interconnection speak well beyond their camp experiences. For as leaders of Jewish institutions, do we not encounter the need to improvise, to be comfortable with the uncomfortable, and to find ways to work symbiotically with our colleagues? Launching a new camp was like creating a living, breathing Jewish laboratory for discovery; we created a safe but wild space for ourselves to grow. What has become clear to me in collecting origin stories like these is that even with all our preparation for the opening of Ramah Galim, it was the magic of creating a social-spiritual landscape for young people to “think on their feet” and to seize and shape meaningful moments together that made for lasting and enlightening experiences.